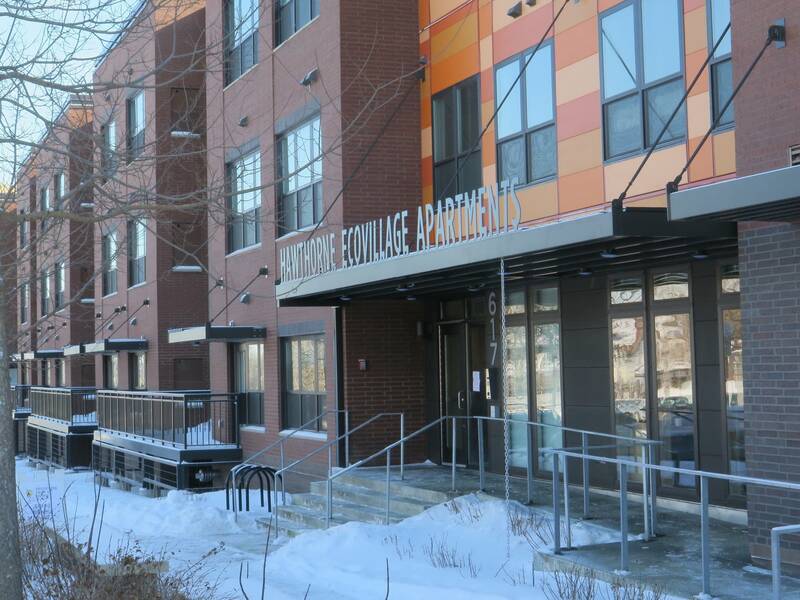 A new apartment complex has opened for north Minneapolis residents whose incomes are below the poverty line. The 75-unit building is part of the four-block Hawthorne EcoVillage at Lowry and Lyndale Avenues North, a project spearheaded by the nonprofit developer Project for Pride in Living. PPL President and CEO Paul Williams said that a third of the units at the EcoVillage apartments are set aside for people with very low incomes, primarily those who've recently left homeless shelters. The rest are meant for residents who earn up to half of the area median income, which is about $42,900 for a family of four. "Finding that workforce housing along a transit line so folks can get to jobs is part of what matters in this neighborhood," Williams said. About half of the building's $18 million cost was covered by the city, including a tax-increment financing package. Williams said another $7 million came from the sale of tax credits. Minneapolis Mayor Jacob Frey, who attended the grand opening Wednesday, said that creating and preserving affordable housing is his top priority. "We're seeing right now that rents are rising out of control and people are getting displaced from the homes that they've loved, the neighborhoods that they've grown up in, and that's not OK," he said. Rents at the EcoVillage apartments range from $670 to $995, and renters must meet minimum income requirements of two-and-a-half times the monthly cost of their homes. Four of the units are owner-occupied.